1783-1874. He was born at Kew on 4 May 1783, the younger son of Admiral Isaac Prescott and of Jane Walter. His parents separated in November 1782 and were divorced in 1785 as a consequence of his father’s cruel, barbaric and inhumane treatment of his mother. His elder brother drowned in 1806 whilst returning from service with the East India Company. On 16 February 1796 Prescott entered the service aboard the Formidable 98, Captains Hon. George Cranfield Berkeley and John Irwin, moving two years later to the Queen Charlotte 100, flagship of Vice-Admiral Sir Charles Thompson. In 1799 he joined the Penelope 36, Captain Hon. Henry Blackwood, in which he served at the capture of the Guillaume Tell 84 on 31 March 1800. In 1801 he transferred to Admiral Lord Keith’s flagship Foudroyant 80, Commander William Young, serving in the Egyptian campaign from 8 March, and on 17 February 1802 Keith appointed him acting-lieutenant of the brig Vincejo, Commander James Prevost, a rank which was confirmed on 28 April. On 26 April 1803 Prescott was appointed to the Unicorn 32, Captain Lucius Hardyman, serving in the North Sea, and after moving on 14 December 1804 to the Aeolus 32, Captain Lord William Fitzroy, he was with Commodore Richard Strachan’s squadron at the capture of four Battle of Trafalgar escapees on 4 November 1805. In the following year, after a short spell aboard the Lord Eldon 18, Captain George Whinyates, he was appointed to the Ajax 74, Captain Blackwood, and afterwards joined the Ocean 98, flagship of Vice-Admiral Lord Collingwood in the Mediterranean. On 4 February 1808 Collingwood promoted Prescott to the command of the brig Weazle, and he was off Sardinia on the ensuing 1 April when a French Toulon fleet of ten sail of the line and three frigates came in sight, having broken out from its base on 7 February. Prescott’s monitoring of the enemy’s movements over the next twenty-four hours earned him the approval of Collingwood, who he had sought out off Sicily, but unfortunately the commander-in-chief was unable to prevent the French from returning to Toulon. Continuing off Naples, Prescott forced a French brig of twenty guns to seek sanctuary under the shore batteries where despite the support of eleven Neapolitan gun-boats she refused to come out and fight. He next blockaded Diamante near the Gulf of Policastro, and on 8 September assisted in the capture of four gunboats and thirty-four coasters that had been sheltering in that port. On 27 October 1809 he captured the French letter-of-marque Véloce 4, and on Christmas Day took the privateer Eole 14, losing one man killed and one wounded in an action of ninety minutes. Another capture was the privateer schooner Ippolite 5, which he took off Sardinia, and he thereafter contributed to the defence of Sicily against Marshal Joachim Murat’s advance. On 25 July 1810, with boats from the Thames 32, Captain Hon. Granville Waldegrave, and the Pilot 18, Captain John Toup Nicholas, under his command, Prescott led a boat attack at Amantea where a host of troops in addition to thirty two storeships and seven gun-brigs which had ran ashore under the protection of two batteries were taken. He was posted captain for his gallantry, the promotion being backdated to the day of the action, but in the meantime, two days after the attack, he had earned further glory by bringing off a gun from Amantea with the assistance of the marines from the Cumberland 74, Captain Hon. Philip Wodehouse. In the next month he captured a xebec and a gun-boat on the same coastline, although these were cast loose after the Weazle lost her main-yard in action with the French batteries ashore. He eventually left the Weazle in February 1811. From 7 August 1811 Prescott commanded the Danish-built Fylla 22 at Jersey, and after transferring from this vessel on 3 June 1813 he commanded the Eridanus 36 off Cherbourg and in the Channel Fleet. During April 1815 he was superseded in command of the Eridanus for what appears to have been the illegal capture of a French vessel at the end of the previous month. After being nominated a C.B. on 4 June 1815, he commissioned the French-built frigate Aurora 38 on 6 April 1821, and went out to South America in June, serving as senior officer at Rio de Janeiro and then in the Pacific Ocean for eighteen months. Here he earned the approbation of the Lima merchants, being granted a testimonial of 1,500 dollars in October 1822 for the protection he had afforded their trade. He returned with freight to England in February 1825 and was paid off. 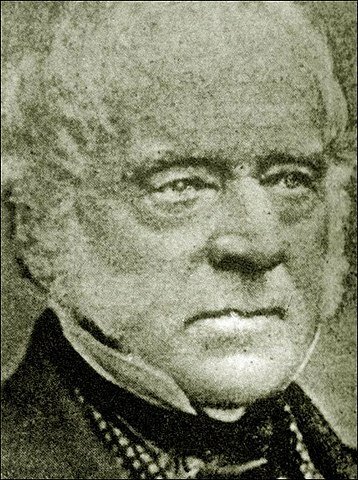 From September 1834 until May 1841 Prescott was the governor and commander-in-chief of Newfoundland where he had to preside over a number of political disputes along fractional lines. He was raised to flag rank on 24 April 1847, and became a lord of the admiralty in June before resigning on 15 December to become admiral superintendent of Portsmouth dockyard, retaining that position until 10 January 1852. He became a vice-admiral on 15 April 1854, a K.C.B. on 4 February 1856 and an admiral on 2 May 1860, whereupon he retired on 9 June. He was afterwards awarded the G.C.B. on 2 June. Admiral Prescott died at his residence in Leinster Gardens, London on 18 November 1874, being buried in Kensal Green Cemetery. On 5 July 1815 on Jersey he married Mary Ann Charlotte, the eldest daughter of Vice-Admiral Philip d’Auvergne, Prince de Bouillon. The couple had four daughters, one of whom, Henrietta, was a respected poet, and a son who took holy orders, and they settled in Surrey where Prescott later served as a magistrate.